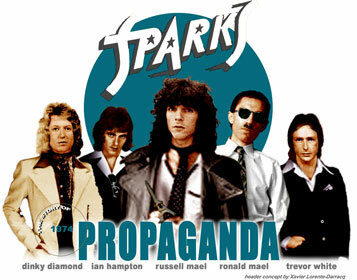 TREVOR WHITE - Guitar player on Sparks ''Propaganda'' and ''Indiscreet'' albums. Trevor White was born on October 3rd, 1947 in Leatherhead, England. Trevor White played in a band called The A-Jaes and one day he sold his Gibson SG guitar to a fellow called Marc Bolan who was member of John's Children. In 1967, Marc Bolan quit John's Children and the band tried to get a new line-up together by asking Trevor White to join them as their new guitarist. Trevor White agreed to join the band but before he got a chance to rehearse with them John's Children had already broken up. Then Trevor White met singer and guitarist Ian "Ralf" Kimmet and they spent some months in Ian's native Jedburgh, Scotland, fulfilling a long cherished desire to "write some songs", and put a band together. With Kimmet's pal bassist Ian Hampton from Edinburgh and with the addition of drummer Chris Townson (ex-John's Children) they put Jook together. The band was managed by John Hewlett (ex-John's Children too). John Hewlett secured a record deal with RCA and a publishing contract with producer Mickie Most. The Maels liked Jook and an idea of merging the two bands was proposed. Jooks own future at that point looked promising and even Sparks were a great group when it came to it the boys felt so bad about breaking up the little family theyd been in for a couple of years. During the "Kimono Tour" and on "Propaganda" Lp Trevor White was playing guitar parts along side with guitarist Adrian Fisher. Trevor White told Goldmine Magazine in July, 1995, "The song Achoo' from "Propaganda" ended with this really great characteristic long solo from Adrian Fisher and the Maels wiped it off and put on all those horrid multi-tracked sneezes. They figured everyone had heard a guitar solo, but they hadn't heard us all sneezing !" Shortly after the recordings of the album Adrian Fisher was fired due to the fact that he was too prominent in his opinion and wanted to have a saying in the direction of music that Sparks should go into. Trevor White always claimed he had fun in Sparks. He played live and toured with Ron & Russ Mael and recorded Sparks' "Propaganda" (1974) and "Indiscreet" (1975) albums. Soon after "Indiscreet" failed to achieve chart access as significant as the two preceding albums, Sparks dismissed. The Brits didn't know which direction the music was taking, but they all felt it time for Ron & Russell Mael to explore new avenues. Trevor White, bassist Ian Hampton and drummer Norman "Dinky" Diamond stayed in Great Britain as the Maels returned to Los Angeles to form a new band to record "Big Beat" Lp. It was a parting of mutual consent (and amicable) which is why the musicians remain friendly with the Maels. 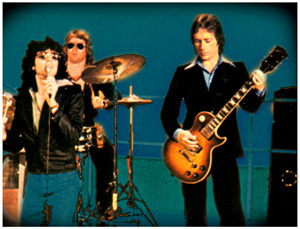 Then Trevor White joined Jet mark II from August 1975 up to August 1976 replacing guitarist Davy O'List. Several demos with Trevor White were recorded, but the band fell apart. Trevor White cut a solo single for Sparks' then-current label, Island. This 7" was a remake of "Crazy Kids" backed by the Jook's previously unreleased (and uncredited) with "Moving in the Right Direction" as flip-side. Trevor White did a video which featured himself playing on the mantlepiece in a living room whilst his despairing parents looked on. Then Trevor White co-produced Radio Stars' first single "Dirty Pictures" in April 1977 and Martin Gordon always had great respect for Trevor's arrangement ideas. For a while, Trevor White led a band with guitarist Adrian Fisher (formerly with Sparks and later with Boxer), bassist Ian Hampton and Marc Mortimore, then Trevor joigned Martin Gordon's Radio Stars. When Martin Gordon decided to leave to form "The Blue Meanies", Trevor White, singer Andy Ellison & guitarist Ian McLeod decided to continue under the name of Radio Stars until September 1979 but the magic was gone with the bass player. 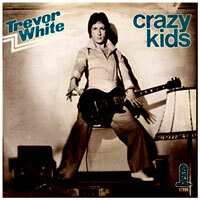 Trevor White's "Crazy Kids" 7"
In 1980, Trevor White hooked up with a new band, The Four Squares. The Four Squares were in fact five : guitarist Chuck "Bob Davies" Wagon (who had left The Dickies), Norman "Dinky" Diamond on drums, Adrian Fisher on lead guitar, Trevor White on bass (!) and manager John Hewlett on lead vocals. At the time John Hewlett, no longer managing artists, wanted to front a band featuring his favourite musicians/friends. The songs were recorded in the now defunct Bearsville Studios, Woodstock, Turtle Creek, N.Y. The Four Squares project failed 'cause guitarist Chuck Wagon died before the recordings were finished and before the band had played "live". The tracks were all John Hewlett/Bob Davies compositions and some of the rough mixes from the sessions - "The Debt", "I Want Her I Need Her", "That Girl" - surfaced in 2007 and were transferred from cassette by Hewlett's friend, singer Ian Kimmet from Jook. Trevor White reunited with Martin Gordon, singer Andy Ellison, guitarist Boz Boorer and drummer Chris Townson in 2000 for the Jet "Nothing To Do Tour" performing his song "Crazy Kids" during the gigs. Trevor never played this song on stage ever. A live version of "Crazy Kids" by Trevor White can be heard on the japanese pressing of Jet's "Music For Herd Of Herrings" Cd. 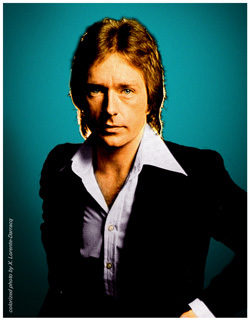 In 1977 Bomp Magazine said Trevor White's "Crazy Kids" was one of the all-time greatest power-pop songs, a definite anthem for the glitter age... Trevor's latest project is named Anytime and he's also compiling an album containing unreleased tracks plus other home and studio recordings to be titled "Music Of White Origin".